WOLF FISHER – The Entertainer! WOLF FISHER is your versatile classic entertainer for shows and corporate events. An international multilingual entertainer, Wolf is the true “Jack of all trades”. All you need to do is make a wish and he will provide excellent customized shows, stage presentations, and deep interaction with the audience using charming comedy for incredible impact! Why Wolf Fisher: Wolf Fisher has more than 25 years of international experience as an entertainer, emcee and performing artist. 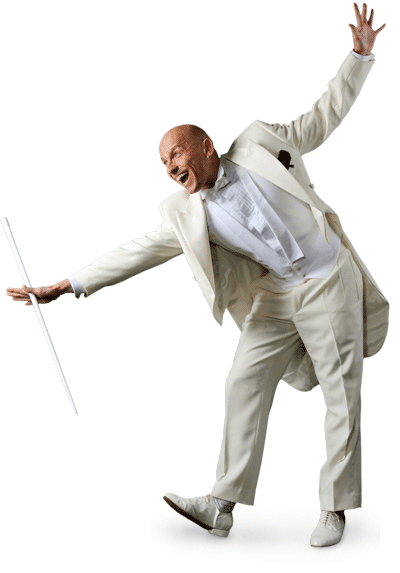 He delights the audience with an enormous repertoire, which can be tailored to your special wishes and requirements. Wolf can easily charm and enthrall small and intimate parties, as well as thousands of keen spectators. Elegant comedy and respectful handling of the audience ensures a memorable and fun experience for everyone. Your guests will always feel comfortable and never get embarrassed. This is important for your guests and even more important for you, the host! Trade show presentations, sales meetings or incentives, upscale events or your own big show with magic, singing with a live band or playback, comedy and skillful artistic performances - the list goes on. Wolf Fisher is a true Classic Entertainer.